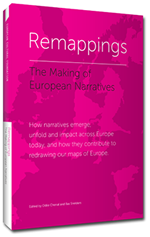 Remappings: The Making of European Narratives edited by Odile Chenal and Bas Snelders is a collection of essays on the changing narratives of Europe, accompanied by comic strips by up-and-coming European comic talents. The book investigates how narratives emerge, unfold and contribute to re-drawing our “maps” of Europe. The foreword is by writer, journalist and presenter Abdelkader Benali with contributors including Amitav Ghosh, Paul Scheffer, Monica Sassatelli, Wietske Maas, Milla Mineva, Wolfram Kaiser, Siebe de Boer, Vladimir and Vuk Palibrk and many more.